In the world of sumo, as in Hollywood, certain couples are legendary. It's like that with Tochiozan and Goeido. These two young men are now to be found in the big league, thanks to Goeido's promotion at the Aki basho. In recent times, those making their debuts in the makuuchi division have tended to excel in their first tournaments. That was very much the case with Tochiozan last March. And Goeido followed the same route, giving a performance in the tournament that was worthy of the hopes, however great, which had been placed on him. It's only fair, therefore, that we dedicate our second article on the Japanese new wave to him. Gotaro Sawai is born on 6 April 1986 at Neyagawa, a town in Osaka prefecture, several kilometres north of Osaka city. He starts sumo in primary school, after winning a local competition. He subsequently attends Furuichi dojo, which has produced many wrestlers, including former juryo Furuichi. From his third year, his name begins to be known in amateur sumo circles. In his fifth year, when he is 11, he becomes "school yokozuna" when he wins the national wanpaku-zumo competition. Gotaro continues his education at Yonchu College in Neyagawa. This will be a carefree period - he will even dye his hair red - but one of stagnation as far as sumo is concerned. The adolescent then leaves his home region and joins the prestigious Saitama Sakae High School near Tokyo, which headhunted him from the Furuichi dojo, an establishment that has produced champions in several different disciplines. Those coming from here and going into sumo have, notably, included former sekiwake Hayateumi (Oitekaze, March 1998 - January 2006), Homasho (Shikoroyama, maegashira), Tochisakae (Kasugano, makushita), Daishoyama (Oitekaze, makushita), and Daishoyu (Oitekaze, makushita). Sawai gets down to work seriously under the direction of the head of the school's sumo club, Michinori Yamada: "He was naughty but easy to live with. He worked enthusiastically on his technique of getting his left hand in", Yamada remembers. His efforts soon pay off and titles accumulate: in three years he collects 11 of them. He will, of course, be high school yokozuna in 2004. In the same year, in front of his Osaka home crowd, Gotaro will also become the fifth junior world champion in all categories. A certain Yuichiro Kageyama picks up the heavyweight title. And to finish 2004, he comes in third in the Japanese amateur championships, a fine performance for a high school student who will have met and beaten both university wrestlers and those in full-time work. He will, in particular, have beaten Hakiai, the university yokozuna. It will have been ten years since a high school pupil last reached the semi-finals of this championship - since Keiji Tamiya (Kotomitsuki) in 1994. This is a nice little milestone on the road. When these championships take place, the young man's future has already been decided. He's going to join the world of professional sumo even before the end of the academic year: "Today's results give me confidence. I really want to do my best in the professional game." It is Sakaigawa-beya which welcomes this very promising recruit. 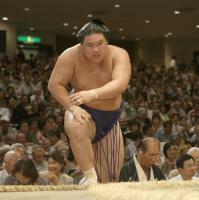 Sakaigawa Oyakata describes him as "a very together young man, whose whole life revolves around sumo". This is January 2005 and Kasugano-beya has itself just recruited Yuichiro Kageyama. The two young men have been rivals since they were at school. Kageyama was school yokozuna but had always rather appeared to be an outsider compared with his senior of one year. And when the two of them join the professional ranks at the same time, it is Sawai who draws attention. The mae-zumo tournament poses no problem for Sawai. 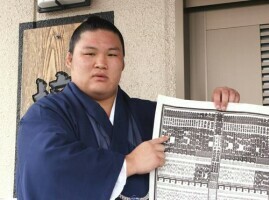 He gets through the test unbeaten, and in the Haru basho of 2005, will appear on the banzuke for the first time, at the rank of jonokuchi 31 west. Right opposite... Kageyama! Thus history repeats itself and the two rikishi will meet up again very soon - in fact in their first bout - the result of which will once again confirm that Sawai has the upper hand. But Kageyama has nothing to be ashamed of in his defeat because his vanquisher will prove to be unbeatable in his first tournament - which he will end with a zensho yusho, no less! His last unfortunate opponent, Nadatsukasa (Irumagawa) had recently been in makushita division, but that did not impress the debutant: "I wasn't particularly nervous. I felt that it would be good if I managed to do my own sumo." His father, up from Osaka, is proud of him: "He says that he won't come home for a year. He's very determined. " Much is expected of Sawai; he has delivered and isn't going to stop his good progress. He is jonidan 25 in the Natsu basho. After his first six bouts, he is one of four unbeaten wrestlers. He is then up against Teruyama, a sandanme rikishi, and loses. He doesn't win the yusho, but it is another superb tournament. And another win over Kageyama, by hikiotoshi, in his sixth bout. Gotaro Sawai has no intention of sticking around in the lower divisions. At Nagoya, in July 2005, he is sandanme 61, and wins his second zensho yusho. At the same time, he achieves his promotion to makushita. In makushita, one can find not only young rikishi on the way up, but also veterans of the sekitori divisions who aren't finished yet. In makushita, life can get complicated, particularly if one arrives there preceded by one's reputation. 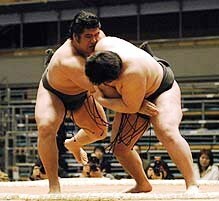 In the Aki basho 2005, Sawai will become used to defeat, but even so he will end up with a kachi-koshi at 4-3. At the Kyushu basho in 2005, his star hasn't yet faded and he sets out to gain himself some additional lustre. At the end of a tournament where he will have faced several serious challenges, he obtains another zensho yusho. (Kageyama wins with a zensho yusho in sandanme). One more tournament of this calibre and he can hope for promotion to juryo in the spring of 2006. Alas, Sawai now enters a dark period. He is struggling with back trouble and starts to underachieve. To start, he completes the January and March tournaments of 2006 with make-koshi. Only just, with scores of 3-4 on each occasion, but his ascent up the banzuke is nevertheless arrested. After the spectacular jump resulting from his zensho yusho at Kyushu, moving him from makushita 32 to makushita 2, he drops back down. But the talent is there and the man has the ability to limit the damage. He finally makes a comeback with a kachi-koshi (4-3) at the Natsu basho of 2006, where he competed at the rank of makushita 9. 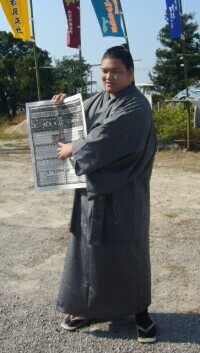 He gets the same score at Nagoya and appears at makushita 6 on the banzuke for the Aki basho 2006. To say that the phoenix then rises from his ashes is a bit of a cliché: but, Sawai wins his fourth zensho yusho, his second in makushita. The time is right and the gates of juryo division are opened to him. He made his debut in mae-zumo less than a year ago, he has a record of 52-18 and has now won four tournaments, each with a perfect record. As very often happens at this stage in a rikishi's career, Sawai takes a different shikona. From now on, it is Goeido Gotaro (ed: in Japanese, the forename goes second) who will step onto the dohyo. A shikona is never chosen by chance and this one has a profound meaning. The first character (go, with a long o) is the first character of his forename, Gotaro, and means power, splendour. The second character (ei) comes from the name of his high school, Sakae Koko, and means glory, to shine. Finally, the last character (do) is "the way" as in bushido, "the Way of the Warrior", the code of conduct of the Samurai. It can be found in most of the names of martial arts, (judo, aikido, karatedo...) and also, of course, in sumodo. "I like my shikona very much, because it contains a part of my name." comments the man himself, smiling. His master Sakaigawa oyakata, former komusubi Ryogoku, jokes about the sound of it: "Goeido Gotaro, Go Go, not bad, eh?" And what of the wrestler behind such a shikona? Sakaigawa oyakata doesn't worry about a few tricky moments spent in makushita by his protégé: "He tasted the rigour of the best of makushita division. That has been very useful to him." Goeido measures 183 cm and weighs 130 kg. In addition to his great sumo sense, he has developed an offensive style based on migi-yotsu, the speed of which gives him a genuine advantage. He enjoys his promotion, of course, ("I am delighted to have achieved my dream of a promotion to juryo.") but has set an objective for himself as none other than Asashoryu, then the sole and dominant yokozuna: "I want to do a type of sumo like that of the yokozuna and quickly rise to a rank where I will be able to face him." In joining the salaried ranks, Goeido has another reason to be pleased: he has caught up with his rival Kageyama, now Tochiozan, who is one tournament ahead of him. Even as a great hope of Japanese sumo, which he appears to be, he may need a time of acclimatisation upon his arrival in juryo. On the 11th day of the Kyushu basho in 2006, Goeido is beaten by Wakanoho and, with a score of 4-7, can't afford another failure. He pulls himself together and wins four in a row, pulling himself out of a hole. He obtains the same minimal kachi-koshi at the Hatsu basho in 2007 with a little bit more elbow room, since he achieves his eighth win on the 13th day. At the spring tournament, it is becoming a habit and the wrestler from Sakaigawa-beya takes part in the yusho race. This will be decided in his 15th bout where he faces Satoyama, the other rikishi at 11-3. Satoyama wins, but Goeido has shown that, even at this level, he is one to be reckoned with. At the same time, Tochiozan is making an excellent debut in makuuchi division. The Natsu Basho sees a return to competition and a 14-1 victory for Estonian Baruto, who has dropped down from makuuchi division following a knee injury. For his own part, Goeido, who can hope for a promotion to makuuchi, puts up a poor performance. His score of 6-9 pushes him down two ranks and forces him to extend his stay in juryo. It is, however, only a setback, and he gets involved once again in the battle for the trophy at the Nagoya basho. He is in good company, as he will compete in a vital tomoe-sen against Iwakiyama, his senior at Sakaigawa-beya and Kyokutenho, both of them makuuchi rikishi who have dropped back into juryo for various reasons. There won't be a yusho for our hopeful, but he is assured of promotion to the top division. 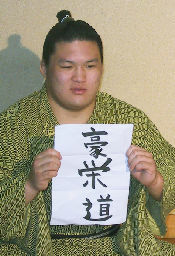 Goeido's name will appear on the makuuchi division banzuke on 26 August 2007. He is ranked at maegashira 14 while Tochiozan, back after an injury, is maegashira 13. Within the seedy atmosphere of the Asashoryu business, the prospect of a rivalry between two Japanese hopefuls aged 20 and 21, both expected to wear the tsuna one day, brings a breath of fresh air, even though the older of the two isn't at his best. Also, their proximity in the banzuke means that it is likely that they will meet very soon, as happened when they first turned professional. On the first day, Goeido fights just before Tochiozan and serves him the ritual water. On the second day they meet, for the third time since their debut, but this time Tochiozan wins. He can't hide his relief. This defeat will prove to be pivotal in Goeido's progress. He will afterwards string together nine wins against maegashira. Then, at the start of the second week, he is among the leaders in the yusho race. He is flanked by Aminishiki, who lit up the first half of the tournament, and Hakuho, who would so much love to win his first yusho as Yokozuna. On the 10th day, only he and Hakuho are left. On the 11th day, the Kokugikan is shaken: Hakuho is beaten by Toyonoshima, while Goeido has the better of Takekaze. The new promotee is in the sole lead! Unfortunately for him, from the following day, he begins to face the sanyaku. First, komusubi Ama, with an okuritsuriotoshi which is one for the annals, and then ozeki Chiyotaikai, defeat Goeido. Finally, on the 14th day, there is an encounter the like of which hasn't been seen for 12 years, between a Yokozuna and a new promotee. If he wins it, Goeido can still hope to win the yusho. But the Yokozuna shows the audacious young man who's who and effectively removes the Japanese rikishi from his path. Goeido will finish with one last win and a score of 11-4. This is a performance which will be rewarded with a fighting spirit prize. The similarities are endless, but Goeido completes a first tournament very like Tochiozan. And just like him, he is reviving hope that one day soon we will see a new Japanese Yokozuna. Goeido's basic information and career records, head-to-heads from Aki basho 2007 and comparison with Tochiozan's career.